The company is under public scrutiny, and has lost more than 12% of its share price so far this week. The social media pundits were out in fine form this week, taking to Facebook and Twitter to rail against the world's latest injustice. And not without good reason. Mylan (MYL - Get Report) hiked the price of its EpiPen product by 461%, from the average wholesale price of $56.64 to $317.82. To add to the injury, Mylan CEO Heather Bresch gave herself a 671% raise. The EpiPen is a lifesaver for people living under the threat of severe asthma attacks and anaphylactic shock. And many of these people are children. Shares of the stock have fallen more than 12% from the opening of the trading week and were down nearly 1.5% in late Thursday trading. A bipartisan coterie of lawmakers have called for investigations into the suspect price increase. They have also contacted the Food and Drug Administration to discuss the approval process for an EpiPen alternative. Democratic presidential candidate Hillary Clinton called for Mylan to lower its EpiPen price. Mylan has lost $3 billion in stock value over five days. 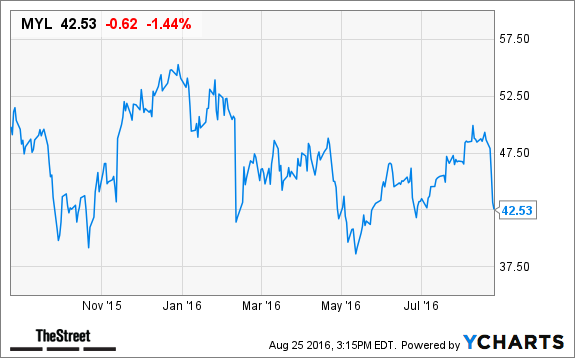 Mylan has dragged down the rest of the health care sector. The iShares Nasdaq Biotechnology ETF has seen its biggest drops in two months. Fellow Big Pharma stocks Merck and UnitedHealth Group have declined by more than 1% each. And even the Nasdaq Composite slipped, trading down 42.38 points, or 0.8%. To be sure, Mylan announced today that it will offer a $300 "savings card" toward the purchase of EpiPens. But this isn't the end of Mylan's woes. With a Clinton presidency looking more like a reality every day, expect increasing pressure and scrutiny to be placed on the company, as well as other drugmakers. That would create a significant weight on stock prices. It may be best to stay clear of biotechs and big pharma companies right now. However, if you want to invest in this sector, Johnson & Johnson represents a safe play. The company not only manufactures drugs to treat everything from rheumatoid arthritis to lymphoma, but it also has a strong consumer products division that produces many staples of everyday American life. After all, no matter who becomes president, Americans will still clamor for -- and Washington won't scrutinize -- baby shampoo and Band-Aids. Clearly, Mylan is a stock to avoid. But what if I told you there is a way to make $67,548 per year - or more - without stocks at all, just by following this simple step-by-step process? The trader who is sharing this secret has been right more than 8 out of 10 times, turning $5,000 into more than $5 million for himself. Click here to see how easy it is to follow his lead and collect thousands of dollars in "Free Money" every month.